Shannon La'Ree: Hey! 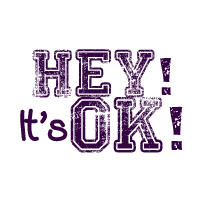 It's ok! Idea from Amber/WhisperingWriter. She got this idea from Glamour magazine. They have a section called Hey, It’s Okay and will list a bunch of things to be okay about. You're welcome to join in and do something like this on your blog. Doesn't have to be on a Tuesday either. Just make sure you link up on her entry! - To create a Hey, It’s Ok! Icon. Actually I just made a quick one with text because when it lists on my entries the other entries you may be interested in I like for them to have pictures lol. Awkward sentence, but you get the point. -To think it’s funny that one of the girls from Teen Mom is Twitighting (Twitter Fighting, I just made it up lol) with the Kardashians because they are pregnant our of wedlock. - To; however, be baffled that the Harry Potter series and the Incredibles (among others) are included in the countdown. They are good movies, but can someone tell me how they are Christmas specific movies? I know there are plenty of movies that fill up the time without needing to stretch out to those, you know? -To get annoyed when movies have characters you just want to yell out, and/or don’t use logic. Tony and I were watching a Christmas movie on Lifetime this weekend, it was called A Christmas Wedding. We came in later in the movie but got the gist of it. This couple was set to get married on Christmas because that’s when good stuff has happened to them. Well, the bride ended up going on a business trip to Floridato close out a major deal to build a condo. She was the Project Manager and Dean Cain was there too. Well she was supposed to leave several days prior to the wedding to get back in plenty of time. Low and behold the deal wasn’t going through so Dean talked her into staying a couple more days. “We’ll have the meeting on the 22nd, you’ll leave that afternoon and be back before your bridal shower on the 23rd.” He told her hey, closing this deal could move you from project manager to VP! So she stayed. Tony was convinced at this time that she wasn’t in love with the guy lol. And I know that would be awesome to be VP, but Why?! Why?! lol. A hurricane ended up coming though and she couldn’t leave. The next morning the hurricane had gone through so she tried to get to the airport but the ferry to the mainland was down (they’d been on an island obviously) She ended up finding a guy with his small boat headed over there that she hitched a ride with. But since his boat was so small she had to leave her luggage. She ended up missing her flight. The next flight wasn’t until 6am the next morning. (The groom ended up having to be the “bride” at the Bridal shower which was funny) She got on the flight the next morning but had a layover. While on the layover there was a kid crying because he couldn’t find his parents. So, of course she tried to help him. She went to the lady at the gate counter but she was too busy and said try security. This is where the main character was starting to really annoy me. At this time they were already calling for the final boarding of her final flight back to Colorado. She went THROUGH security to go to the security office! Hello! There were officers at the counter! One of them even had to release the belt thing to let her go through! I know you want to help the kid and all, and that’s awesome, but leave him with that security they can help him! She left him in the office and tried to run back through the security gate but they had to detain her. So…dun dun dun. She missed her flight, and there weren’t anymore flights. I think at this time it was the 25th and it was 12 hours to the wedding (they had a countdown every so often) She looked back and the parents were with the kid at least. They offered to drive her to Mephis because that’s where they were headed for an Elvis Christmas. So she hitched a ride with them. They stopped for BBQ and all got sick so she ended up hitching a ride with a motorcycle crew to go to the Little Rock airport. After the kid stole her phone and wouldn’t give it back she had to use Big Daddy’s phone (the head of the motorcycle crew) so her Groom wasn’t answering calls from her. She ended up getting a flight from that airport but it had another layover. While in the air the lady next to her was talking about how her husband went into the hospital while she was away at her sister’s so she’s trying to get back to him. The captain comes over the intercom and says that all public transport is down due to a strike. Tony and I were yelling at her, don’t do it! But yet, she’s like I’ll drive you! I have an 1 ½ layover. There were no cars at the rental place, but she talked the guy at the booth into using his car. It was a stick shift, which she doesn’t normally drive. At this point, I was like oh great she’s going to miss another flight! Thankfully she got back in time and made the flight. However, a blizzard started and the plane couldn’t land in Colorado and had to land 100 miles from her destination. This was at like3 hours to the wedding I think. At 1 ½ to the wedding the wedding guests were all already at the Church. Come on, really?! The Groom came up with a plan and told all the guests to head over to the bar while they got the bride there. He ended up sending a rescue helicopter. Then it cut back to the Church where it said it was 10 minutes to the wedding time and the Pastor came up to the groom and was like “I’m sorry but the congregation is already arriving for the candlelight vigil” It was 10 minutes to the wedding! The vigil shouldn’t have been for at least another 30 minutes, so why was he trying to say the wedding wouldn’t happen? Lol. The groom ended up inviting the congregation to the wedding. It was just odd the timing of it. The helicopter couldn’t land at the church so the groom took the guy with the one horse sleigh to go pick her up. They got back and was married and the invited everyone to go drink at the bar.